Vibrant coral reefs, tropical fish and white-sand beaches – what more could you want? Thailand has many things to see and do for all travelers, especially those looking to get their toes wet! With off-the-beaten-track adventures and day trips to nearby islands, you’ll be sure to enjoy all that Thailand’s snorkelling has to offer. Snorkelling is one of the most popular things to do in and around Thailand’s southern beaches and, when the island’s glittering waters and colourful aquatic scenery are beckoning, why not? No matter whether you’re an experienced diver or fresh-faced snorkeler, Thailand has you covered. Slip on a pair of flippers and discover this underwater haven. When snorkelling in Thailand, you are guaranteed to be in awe of the pristine turquoise water and all that lies beneath. Thailand is perfectly placed between the Gulf of Thailand and the Andaman Sea making it the snorkelling mecca of the world. Journey out to the islands in the Gulf and you will find your Instagram-worthy snorkelling destinations. Silky-sand beaches lined with swaying palm trees and underwater sanctuaries. Now, that’s the life! Day trips are available to the nearby island, Koh Tao, where you’ll find Koh Nang Yuan or Aow Leuk Bay – some of the best snorkeling spots in South-East Asia. For those who want to stay close to home, many beaches around Thailand have clear, shallow waters to bask in. Karon, Laem Singh and Merlin beaches are some of the most popular and exquisite for snorkeling. Stay at the Kata Rocks Resort & Residences and you’ll be right on the shores of the stunning Kata Beach. The rocky headlands here have become a shelter for marine life which makes for great snorkelling (even in peak tourist season!). Head back to the resort for a relaxing spa treatment or venture further afield to Kata Noi for more snorkelling fun. These are the places where snorkelling comes to life! Drift past anemones, discover vibrant coral and swim alongside an abundance of sea life. 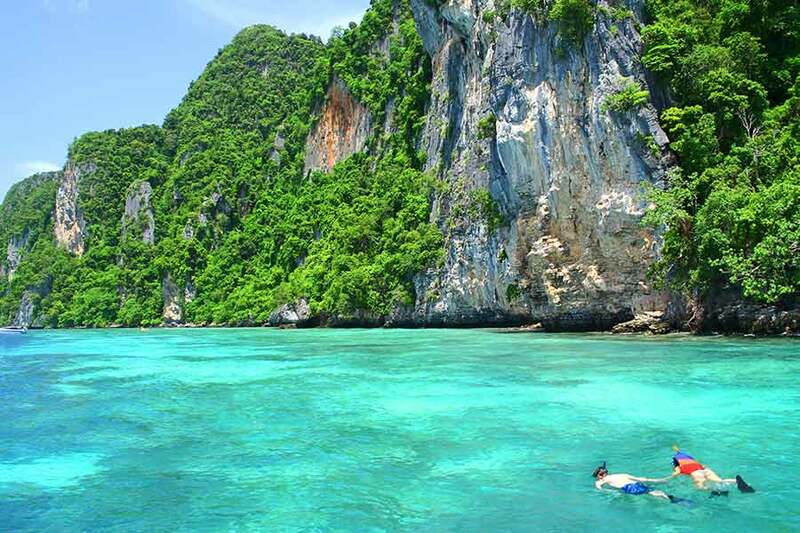 The snorkeling season runs year-round in Thailand due to its tropical climate. Average water temperatures range from 26-31°C which means you don’t need a wetsuit! For ideal beach and snorkeling weather, plan your trip between November through to April. A perfect destination for time away with the family during school holidays, an adventure for a group of friends, or a romantic escape for couples – snorkeling in Thailand impresses everyone!